PT Asuransi Jasa Indonesia (Persero) - Asuransi Jasindo or referred to as "JASINDO"is a a reputable state-owned company in Indonesia, running business in general insurance industry. JASINDO offers a large selection of general insurance products. Its products include 9 corporate products and 10 retail products. JASINDO is a state-owned company and is fully-owned by the Government of Indonesia. 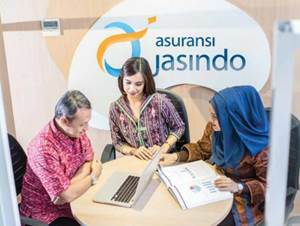 Asuransi Jasindo was established in 1972 as a merger results of PT Asuransi Bendasraya and PT Umum Internasional Underwriters (UIU). Headquartered in Jakarta, JASINDO now has 48 branch offices, 36 sales offices, 1 Takaful branch office, 7 Takaful Sales Offices spread across Indonesia (as of December 2015). In 2014, JASINDO booked an increase in its operational performance. According to PT Asuransi Jasa Indonesia (Persero) Annual Report 2014 as cited by JobsCDC.com, JASINDO booked total assets of Rp 11,296.05 billion in 2014. This reflected an 40.25% increase from Rp 8,054.17 billion in the previous year. Total comprehensive income to Rp 400.98 billion in 2014, which represented an increase of 50.42% over total comprehensive income recorded in 2013 of Rp 266.24 billion. Indonesian Citizen (WNI), Male or Female with maximum age of 26 years old (maximum birth year on 1990). Single/un married and willing not to get married for 1 year. Minimum Bachelor Degree (S1) with GPA min. 3.00 within 4.00 scales, from the faculty/discipline : Accounting, Marketing Management, Business Management, Communication Studies, Civil Engineering, Mechanical Engineering, Electro Engineering (Power Lines), Industrial Engineering. Graduated from a reputable university with minimum accredited B (PTN) and accredited A (PTS). Demonstrate good communication skills and fluent in English both of oral and written. Willing to be placed throughout the working area of JASINDO by signing a bond agreement. Indonesian Citizen (WNI), Male or Female with maximum age of 35 years old (maximum birth year on 1981). Minimum Bachelor Degree (S1) in any field with GPA min. 3.00 within 4.00 scales. Minimum 3 years of experience in the field of Law, Public Relations, Protocol, Marketing, Agriculture/Agribusiness/Agronomy, Health/Medical/Doctor/Physician. JobsCDC.com now available on android device. Download now on Google Play here. Please be aware of recruitment fraud. The entire stage of this selection process is free of charge. PT Asuransi Jasa Indonesia (Persero) - Management Trainee Program JASINDO June 2016 will never ask for fees or upfront payments for any purposes during the recruitment process such as transportation and accommodation.